Looking for a healthy lunch dish? Our recipe for broccoli cheddar quiche is light and wholesome, and flavorful too. It’s a great dish to try out for the family since it features a toothsome combination of cheddar cheese, Dijon mustard, and sour cream—this has to be one of our tastiest lunch recipes to date! The recipe makes for seven servings and it’s an ideal dish to serve for either lunch or dinner. If you happen to know someone who loves quiche, then feel free to share this recipe with your friends and family on Facebook, Twitter, or Pinterest. We’re positive that they’ll all love it! Interested in trying out this recipe for broccoli cheddar quiche? You’ll find that the recipe itself is simple, and it should take roughly 45 minutes to an hour to prepare and cook everything. However, once the quiche is done cooking, please remember to let it stand for roughly ten minutes—you have to make sure that the quiche settles properly before serving. To get started, you’ll need five slices of white bread, some chopped onion, olive oil, one cup of Egg Beaters, Cabot Light Sour Cream, thyme, Dijon mustard, black pepper, broccoli florets, 2.5 ounces of Cabot Sharp Lite75 Cheddar and 1.5 ounces of Cabot Extra Sharp Cheddar. If you enjoyed trying out our broccoli cheddar quiche recipe, then you should also try out our crust-less spinach quiche recipe too—it’s one of our most popular quiche recipes! Cabot is a cooperative of over 800 farm families, and we’re proud of all the different award-winning cheeses that we make. 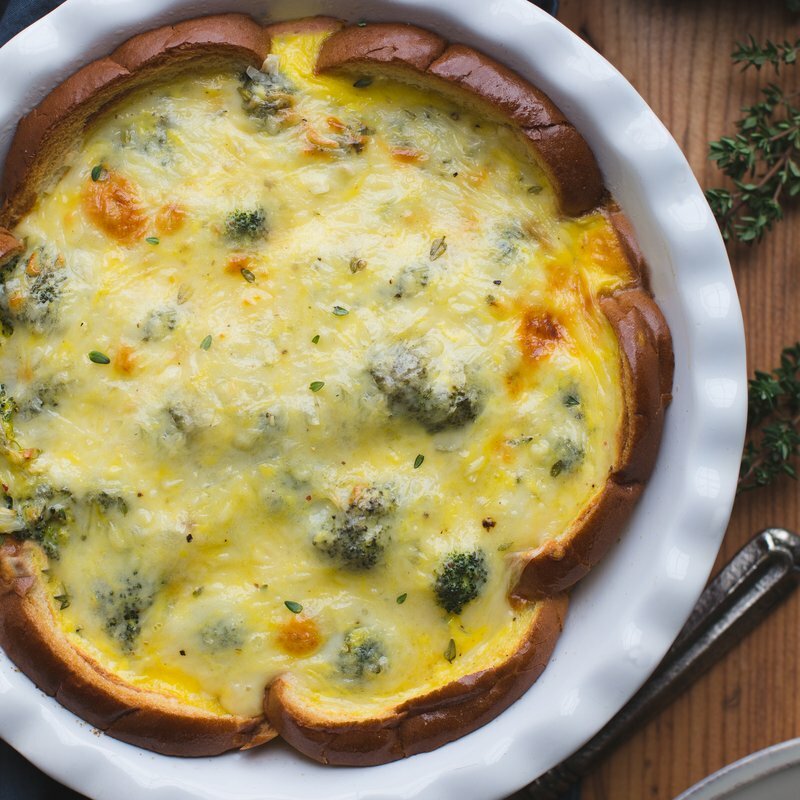 While we’re confident that everyone will love our broccoli cheddar quiche recipe, we want to hear some feedback from you. Did you like the recipe? If so, please go ahead and rate and review it. We can’t wait to check out your feedback. COAT 9-inch pie plate with cooking spray. Press first slice of bread into pie plate, with one edge even with top, firmly pressing it into corner to fit shape of plate. Press remaining slices in place to form single layer of bread slices, cutting to fit where needed. PLACE in oven for 10 minutes or until set but not browned. Meanwhile, combine onion and oil in small skillet over medium-high heat; cook, stirring occasionally, until onions are softened and lightly colored, about 5 minutes. WHISK together Egg Beaters, sour cream, thyme, mustard and pepper until no specks of white remain, in medium bowl. ARRANGE broccoli over bottom, when crust is baked. Top with sautéd onions, followed by cheeses. Pour egg mixture evenly over ingredients in crust.